Anyone looking for a fuzz pedal? Found a nice deal on the Way Huge Swollen Pickle Fuzz this morning, so if you’re looking for a fuzz, this might be the opportunity you’ve been waiting for. The Way Huge Swollen Pickle is a very versatile fuzz allowing you to get a variety of fuzz tones, from serious gained distortion, to super scooped ‘metal’ to more classic sounding distortion/fuzz. The most sought after and corpulent Way Huge pedal is back! The Swollen Pickle MkII surrenders super high-gain fuzz with copious amounts of smooth low-end to all who dare plug into it. With a twist of the Sustain control, you’re taken from mild crunch to Armageddon! The Filter control retains its trademark insane range of heavily band-pass-filtered tones, distinguished by remarkable girth and sizzle, and the Loudness puts out enough volume to clobber any amp! Newly added features include a tone stack Scoop control that elicits classic Swollen Pickle mid-scoop or a flat mid-frequency sweep, and a Crunch knob to adjust the compression intensity of the fuzz. Finally, under the hood, the Swollen Pickle MkII has two internal mini controls; Voice sets the intensity of the external scoop control from light to heavy mid cut, and Clip varies between two sets of clipping diodes for smooth or opened fuzz sustain. 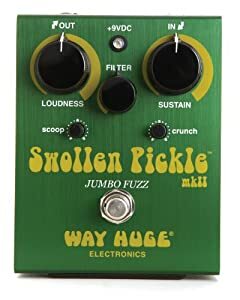 The Way Huge Swollen Pickle lists for $265.17, and is usually available for $130, but is currently on sale for only $99.99 at Amazon.com. $30 off the regular price, not too shabby! Not sure how long this offer will be available, so if you’re looking to pick up a fuzz, you might want to jump on this one. If you were only gonna have one Fuzz pedal, it should be this one. It sounds amazing, plays well with other pedals (you can put it anywhere you want to in your chain), and is the most versatile, flexible fuzz pedal (or dive pedal, for that matter) I’ve ever played. Just buy it, you won’t regret it. I’m really tempted to buy one of these. I have a Big Muff (tall font, mid 90s version, still have the wooden box), but doesn’t seem to play nice with other pedals and sound is a bit rough with Les Paul. The Pickle would be a good choice. No matter what, I would hold on to the Muff.. That sounds like the older ‘russian’ muff (green tank like enclosure). Those are pretty sweet, and collectible.